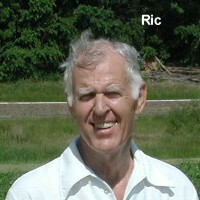 Ric Banholtzer helped out with field supervision from 2001 until 2005 when health problems forced him to REALLY retire. Ric's hobby is wood working -- building small furniture items--especially for the grandchildren. Ric also took the Master Gardener program at Mo. Botanical Gardens and has been a serious bird watcher since 1958. He has a lifetime list of over 300 bird species sighted. 11__12 1944-1945 Worked on bailer pushing & pulling plus special tie on tie wires @ header boards. worked on combine when harvesting wheat, tying the sacks when they became full--learned special tie that was fast to do. 13-15 1946-1948 Worked for truck gardener, mainly picking tomatoes. Also dusted cabbage plants with arsenic. His back would get tired of bending over on each plant so he poked holes in the bottom of a syrup can with an ice pick. He then tried a rope and just shook it once over the plants. The farmer thought that was a pretty good idea. 18 1951 Carpenter apprentice for Fruim Colnon Corp.
24-25 1957-1959 Attended college. During the summer worked for a local home builder doing carpentry, labor, drywall, painting, landscaping. 26 1959 Draftsman for Food Equipment Mfgr. Draftsman for Niehringhaus Metal Products. 26-34 1959-1967 Purchasing Agent for Bank Building Equipment Corp.
34-58 1967-1991 Estimator for Bank Building Equipment Corp.
2006 ? really "retired" ?